This topic contains 14 replies, has 4 voices, and was last updated by chrrit 3 weeks, 5 days ago. Anyone got an idea please? If you watch the update, you will momentarily see “Installing system update” and progress bar, then an image of the Android “droid” laying on its side and the word “error” for a few seconds before it reboots automatically. Which means the OTA/wireless update didn’t get applied. FYI, my Settings –> About Tablet says I have a Model U1005 running vendor-supplied Android 8.1.0 with Build number U1005_V1.0_20190116. I haven’t loaded/flashed any mods — I’m running completely vanilla as delivered by the manufacturer. Hi. I have the same issue on my european Alldocube X (U1005E). Download OTA 20190313, unpack, reboot in recovery then fails with an ‘error’ message shown on recovery screen. Then reboot in its previous non updated state. I secured the Android boot on my device with a scheme I have to draw on a 3×3 grid (at each reboot). Maybe this is related ? just to add, the same happens if you download the update file and start a local update…. Android tablets/phones have a 2nd bootable image, called the recovery image, separate from the “system” image that you normally run. 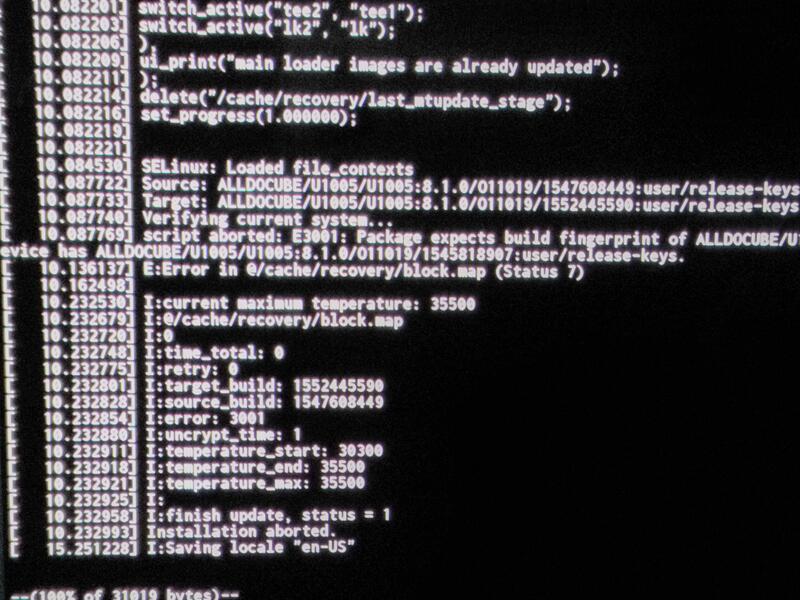 The recovery image can be used to (a) recover (duh) if your system image becomes broken and unable to boot, and (b) to do updates to the system image because it can cause problems for a system image to try to update itself while it’s running. Method 1: Power-off the tablet, then simultaneously hold down the power key and one of the other keys (volume-up or volume-down). I couldn’t get either key combo to work by experimenting, tho this method is somewhat timing dependent. It would help if Alldocube let us know the key-combo needed for for the Alldocube-X. so,the pic is your recovery.log.and your tablet android os build number is U1005_V1.0_20190116? Yes, that photo is of the recovery.log (while booted into recovery) after a failed wireless update attempt. And yes, my Settings –> About Tablet says I am currently running Android 8.1.0 with Build number U1005_V1.0_20190116. 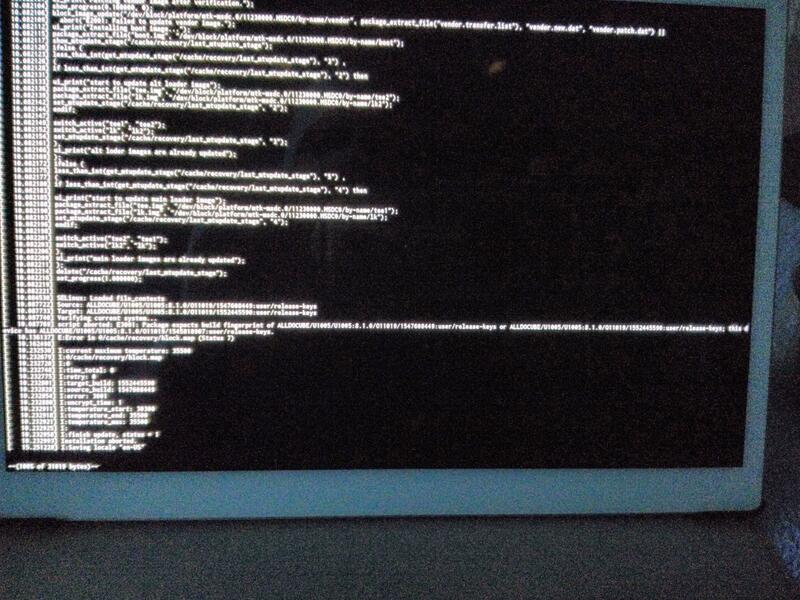 Here’s another photo of the log that shows the full error message line (including the keys it is expecting to find). Is there some way to grab the text version of the recovery logs? If this recovery was TWRP, I’d just boot into TWRP recovery and pull the files via adb. Yes, that new OTA package installed completely. Thanks! one more question ,is your android update from build number 20181227 to 20190116,and then update to 20190313? If this is the case, probably know what caused the upgrade error (1227-0116 OTA package problem). TF packages of 20190116 or 20190108(for u1005e) will be released next week, flash 20190116 or 20190108(for u1005e) TF packages ,and last upgrade firmware to 20190313 version.that may be final sulution. I had contact with the support and they have uploaded a new OTA package and it works now!